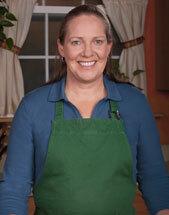 Kim Sopczyk, the host of the 'From Farm to Table' cooking series from WMHT-Albany, N.Y., is a nutrition community educator for Cornell University Cooperative Extension, located in Warrensburg, N.Y.
Sopczyk holds a Bachelor's degree from the State University of New York at Plattsburgh and has completed several certificate programs at Cornell University. She volunteers in the 'healthy recipe' program at a local church, which provides the local food pantry with ingredients for healthy, simple meals. She lives in Glens Falls, N.Y. with her husband and three sons.